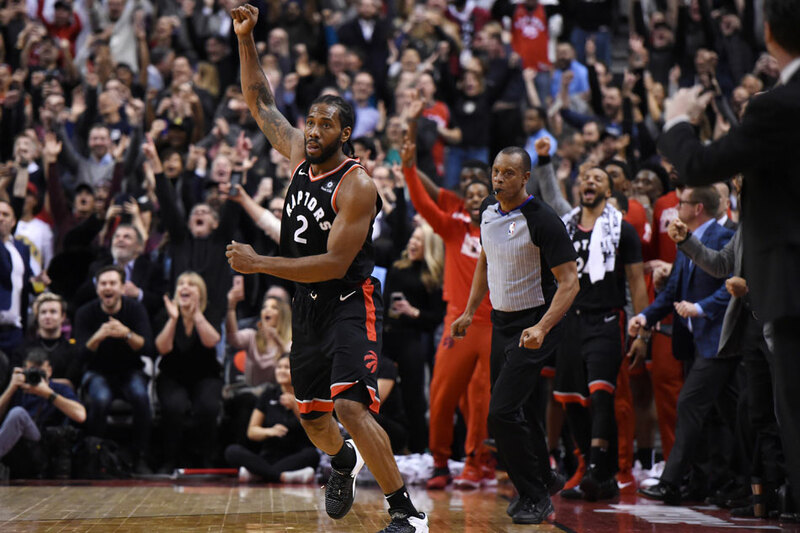 Kawhi Leonard banked in the go-ahead field goal with 4.2 seconds to play as he scored 30 points and added eight assists to help the Toronto Raptors to a 127-125 victory over the visiting Brooklyn Nets Monday night. Marc Gasol added 16 points -- 11 in the fourth quarter -- for the Raptors, who have won five in a row. D'Angelo Russell had 28 points and 14 assists for the Nets. Joe Harris added 24 points, Allen Crabbe had 22, Jarrett Allen 15 and Shabazz Napier 10. The score was tied when Gasol, playing his second game for the Raptors after being acquired in a trade with the Memphis Grizzlies, scored seven of Toronto's first nine points of the fourth quarter as Toronto took a 101-94 lead. After Brooklyn pulled to within two, Toronto again opened a seven-point lead on Gasol's 20-footer with 6:49 left. But Crabbe later hit back-to-back 3-pointers to tie the game with 1:34 remaining at 120. Russell nailed a 3-pointer with 50.2 seconds left and the Nets led by three but Danny Green's 3-pointer tied it. Harris missed a short jumper, setting up Leonard's late heroics. Harris scored 15 points to lead Brooklyn to a 29-21 lead after the first quarter. After Leonard gave Toronto the lead with a 15-footer with 1:06 left, Harris closed the first half with two 3-pointers to give Brooklyn a 60-56 lead. The teams were tied six times in the third quarter when Lowry's jumper gave Toronto a two-point lead with 6:24 remaining. Ibaka's hook shot to bumped the lead to four. Ed Davis tied the game again on a layup with 3:10 left in the third, taking advantage of Toronto's shot-clock violation. The Raptors were without guard Fred VanVleet, who is expected to be out at least three weeks with an injured thumb.